The Internet Archive is a non-profit digital library which offers permanent storage and access to collections of digitized materials, including websites, music, moving images, and books. Its stated mission is: “Universal access to all knowledge”. Hazard Records is a netlabel hosted (among some 1500 other labels) in the “Netlabels” section of the Internet Archive since June 2004. When we (Hazard Records) moved all our files into the Internet Archive we let them know explicitly that some of our releases might deal with appropriation, since we did not want to cause trouble to the Archive. The staff at the Internet Archive let us know that this was not a problem for them. In august 2008, Hazard Records released the album “This Is The End, Beautiful Friend”, by File Under Toner (a pseudonym Anki Toner uses for some projects) and uploaded it to the Internet Archive (as had done with its 60 previous releases). The record has thus been hosted at the Internet Archive during two years, without problems. This album, and all other albums released by Hazard Records, is in the Public Domain. “This Is The End, Beautiful Friend” was made by recording run-out grooves (supposedly silent) of thirty-six selected records and manipulating them both by analogue and digital means (mainly by playing them on vari-speed turntables and adding delay, echo and reverberation). The audible result is a series of thirty-six short tracks of manipulated surface noise (mostly pops, cracks and hiss). The first of such criteria was format. 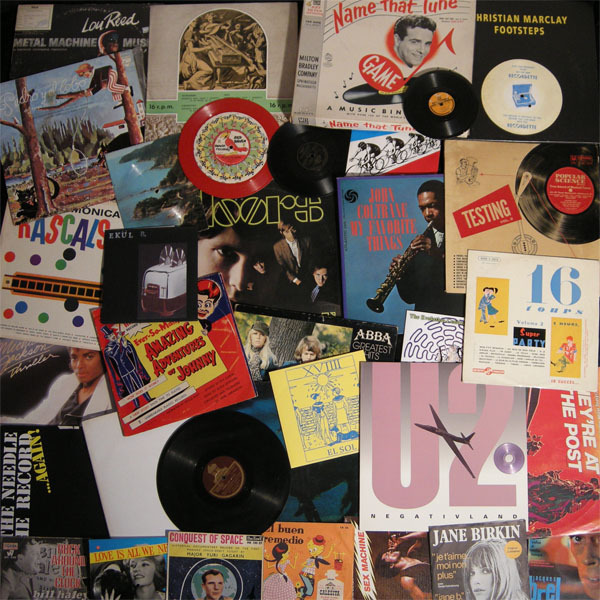 The records used were mostly vinyl, but also shellac, cardboard, and even less usual formats, looking for a different “grain” in the original sound. Finally, some of the records were chosen for “political” reasons. This record poses a couple of questions: “do the silent run-out grooves have copyrights?” and “in case they have, who do they belong to?”. For this reason, it uses records from artists who have been involved in copyright infringement cases before. We have used run-out grooves of records by Abba, Michael Jackson and James Brown, all of them known for suing artists who had used fragment of their works out of context. We have also used the run-out groove of one of the few surviving copies of Negativland’s “U2″ record (almost all the copies of which -masters included- were destroyed for copyright infringement). Of course, none of this would make much sense if the source of each silent run-out groove was not clearly explained in the liner notes. But these are strange times, and explaining too much can be troublesome. According to the US law (and we must remember here that the Internet Archives servers are on US soil), Internet Service Providers are not liable of copyright infringement if they do not have actual knowledge that they are hosting infringing material, but they must act as soon as they are notified of a possible infringement, or else they risk being prosecuted. This means that any person claiming to be (or to act in the name of) a copyright owner can notify a copyright infringement and possibly have a file removed from the Internet, without need that a judge, court or jury sees the case. The Internet Archive, specially in sections such as Community Audio, runs the risk that some users upload copyright infringing files (and, what is worse, for reasons quite far from the Archive’s stated mission). In fact, some users do. We understand that they are forced to “make unavailable” a number of files. They probably spend much more time and effort on that task that they would want to. This is strange, since our experience with the Internet Archive staff has always been very positive in the past. They have always been helpful and quick to answer. Nevertheless, at Hazard Records we believe that all this nonsense is a consequence of the pressure that receives any institution that tries to enlarge the borders of free culture, like the Internet Archive does. This battle is being tough, since questioning copyright (even, not reclaiming one’s possible copyright and placing works in the Public Domain) represents attacking capitalism itself. That is why we have decided to assume that this record has been “made unavailable” by mistake, detected by some robot or caught in some sort of automatic copyright infringement filter. We do not believe that the Internet Archive is interested of getting rid of this or any similar work (while the opposite might be true), though they probably have their hands tied in these situations. So, we have un-censored the record (made it available again) in October 2010. Just to (try to) keep things calm, we have removed (part of) the liner notes and replaced them by the open letter we wrote to the Internet Archive. The original liner notes can still be found in a text file (hopefully invisible for automatic filters). We hope that this is a good solution for this situation. However, it might be a good idea to download the record quickly, just in case. Megamix Militia didesain untuk mengajukan pertanyaan-pertanyaan kritis seputar otentisitas, orisinalitas, kebaruan, serta melakukan eksperimen dan pencarian bentuk-bentuk alternatif produksi budaya dalam konteks perkembangan media dan teknologi yang berperan sebagai salah satu jalur utama produksi, persebaran, dan akumulasi produk pengetahuan dalam kehidupan sehari-hari. Read more.